If you’ve even heard of the Scottish delicacy called Haggis, you are probably grossed out by the description. I think people enjoy describing it in the most off-putting words possible, just to scare others, and maybe make themselves seem cool and adventurous for trying it. To be honest, it’s no more exotic than any other sausage — I’d classify it as a type of sausage, and those in sausage making forums agree. 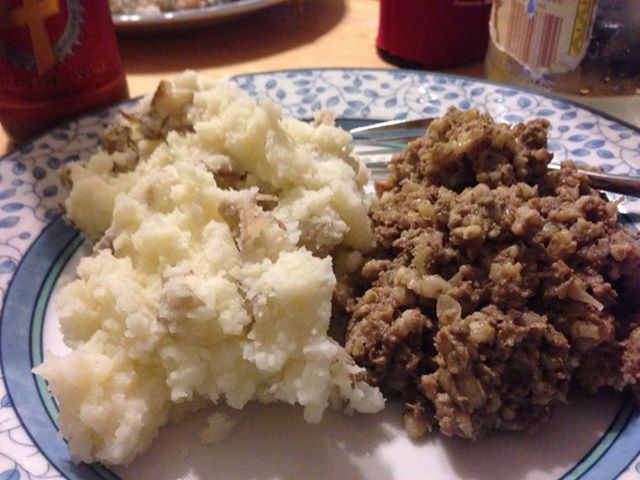 For those who aspire to no-waste nose-to-tail eating, Haggis is perfect. It’s probably not all that bad for you, health-wise, either. Like any sausage, it likely evolved as a way of making the not-as-attractive parts of meat more palatable and, like many sausages, it can be delicious. Ever since I bought a meat grinder/sausage stuffer attachment for my KitchenAid Stand Mixer, I’ve been wanting to try to make haggis, as it’s the national dish of my husband’s home country, and I like to take on a cooking challenge — at least once. Yesterday, being a Saturday and Burns’ Night, seemed the perfect occasion. The big differentiator between Haggis and other kinds of sausage is its shape — it’s more round or oval than long and thin, and, therefore, the casing (which isn’t eaten) must be larger to accommodate it. 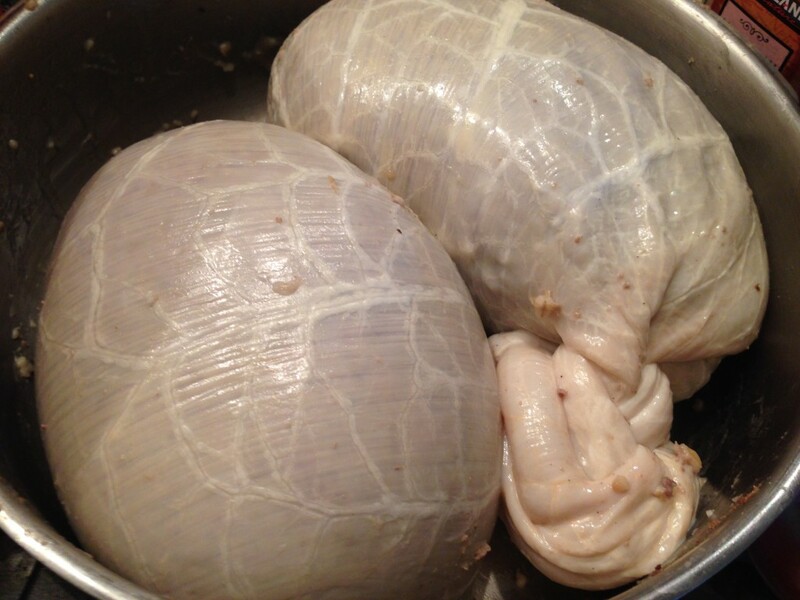 So, while other sausages with natural casings utilize sheep’s or hog’s intestines, a Haggis uses beef innards — specifically, a beef bung, which I believe is part of the stomach. Yes, it’s kind of gross. You have to order any casings through an online butcher — at least that’s the only place I’ve found them, though some of them sell through Amazon. When I got this crazy idea in my mind, I started ordering the ingredients. Besides lamb hearts and liver and the aforementioned casings, everything I needed was either already in my pantry or available in the local grocery store. 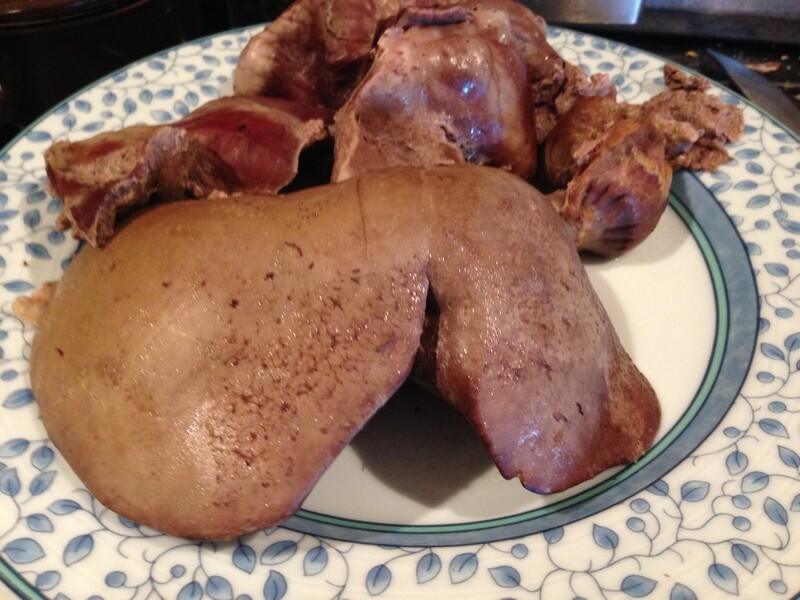 The lamb hearts and liver I procured from a farm not far away in Central Texas called I O Ranch, which raises and sells grass-fed Dorper lamb that’s processed locally. And there these harder-to-get ingredients sat in my refrigerator and/or freezer until inspiration struck yesterday. I stuck to it, mostly, but, since I don’t think or cook with grams, I made some adjustments. 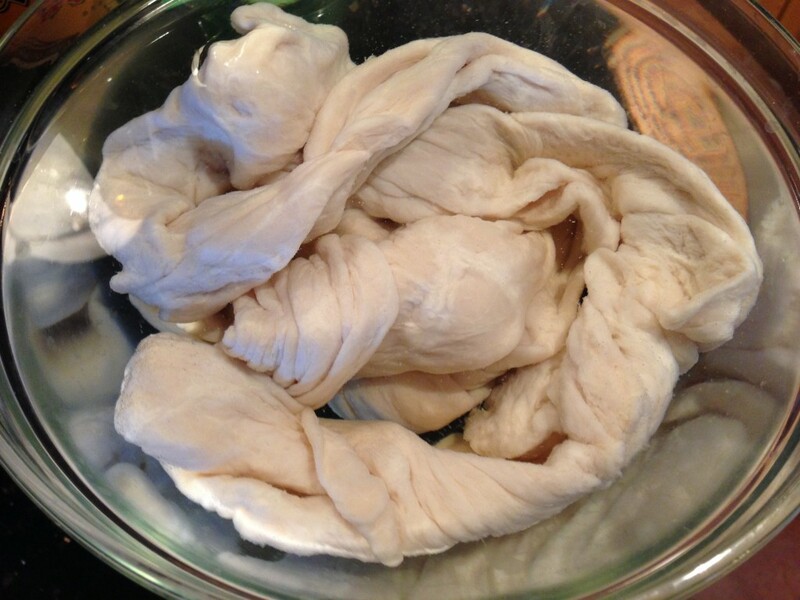 Rinse beef bung thoroughly under lukewarm water and leave it to soak at least 60 minutes. Boil liver and hearts in plenty of water — you’ll use the broth later to cook the oatmeal and barley — for around 1 1/2 hours. While the meat is boiling, brown the chopped onions until they soften and begin to turn brown. Cool and set aside. After the 1 1/2 hours, remove the meat from the pot and set aside, reserve the cooking liquid. When this is done, use the meat broth as the liquid to cook the oatmeal and barley. You need to cook them separately as the barley takes longer. For barley use 1 1/2 cups barley and 6 3/4 cups of the broth. For oatmeal, use 1 cup of oatmeal and 4 cups of broth. I did this in my pressure cooker so it was 18 minutes (at pressure) for the barley and 10 minutes for the oatmeal. If you do it in a pressure cooker, make sure you add some fat (I added olive oil) so it doesn’t froth too much and boil over. While these are cooking, use a meat grinder to finely grind the hearts and livers. They are remarkably easy to grind. Follow this by grinding the suet — make sure you’ve got real dense pieces of fat rather than connective tissue, as I ended up with a few pieces and the connective tissue doesn’t grind well. Once everything is ground and/or cooked, mix all the prepared ingredients together in a large bowl or pot. Add the ground lamb and all the spices, mixing everything well. To make sure it’s spiced to your liking, remove a little bit and microwave it, then taste and adjust your seasoning accordingly. Then, use your sausage stuffer to feed this mixture into your casing. For us, this amount of stuffing made 3 haggises, of approximately 2-3 lbs each. After the first, tie off the end with kitchen twine, and use the twine to secure each open end of the others. Freeze whatever you don’t want to cook immediately. When you’re ready to cook, defrost if needed, then wrap the whole thing securely in aluminum foil, to contain the filling if the casing should happen to burst. Simmer in a large pot of water for around 35 minutes per pound. 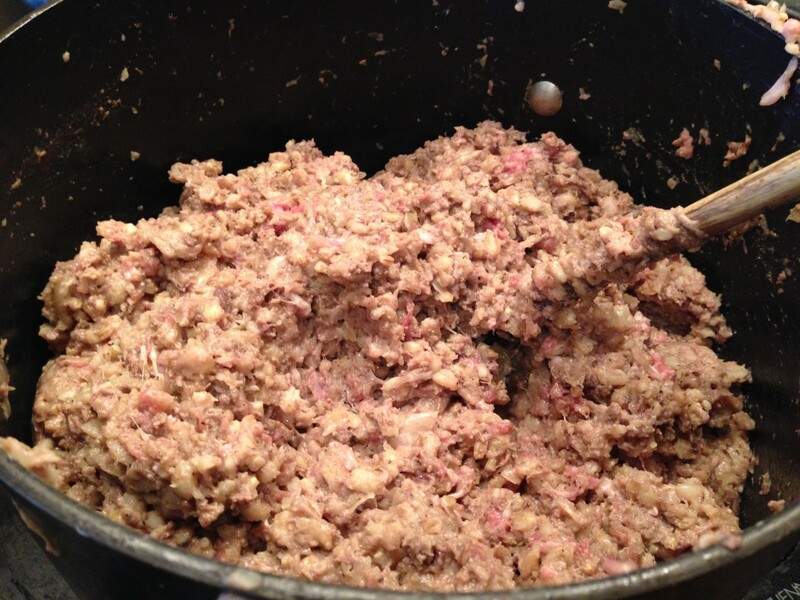 Serve by cutting into the casing and scooping the meat/grain/spice mixture out — it looks a bit like ground beef. 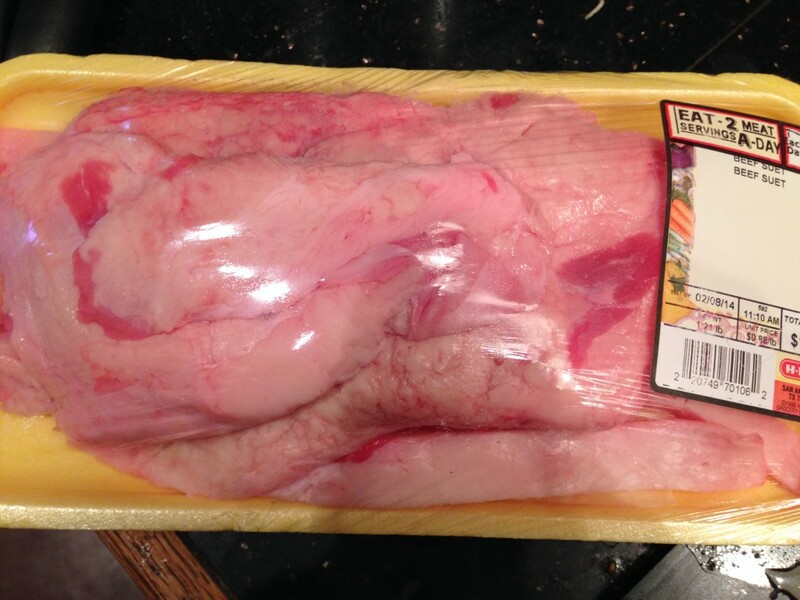 When you cut into it, you or someone must recite the traditional “Address to a Haggis” by Robert Burns. Typically, Haggis is served with mashed potatoes (tatties) and turnips (neeps), but what Scots call turnips we call rutabagas in this part of the world. Others call them swedes. I noticed that the black pepper and the white pepper measurements in the original recipe are given in tablespoons, while in the adapted recipe are the same number but in teaspoons. That’s a huge difference. Did you mean to use tablespoons for both? Good question! It’s been so long since I made it that I don’t recall, but I suspect that I would have kept the amount the same. So… it’s likely tablespoons. I’ll adjust the recipe to reflect that. Appreciate the note! As long as you don’t overstuff the bung (around 2/3 full) and pierce it all over with a needle before cooking, you don’t have to worry about it bursting. Thanks for that tip. Will make sure I do it that way next time!